What were these folks doing at Changi Airport? After weeks embedded inside this project, I can finally show you what was happening at Changi Airport. That is the official video of the fantastic event involving more than 400 dancers of all ages and races. I will have more Changi Airport Millionaire Dance videos of my own to share over the next few days. 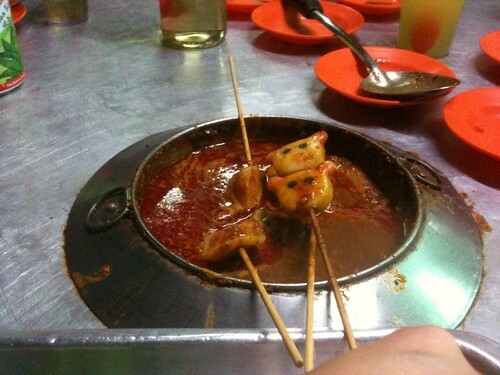 Ban Lee Siang Satay Celup aka Lok Lok! Don't ask how that satay sauce has been there or how many people have dipped their sticks of stuff into it cos we don't wanna know. It turned out to be pretty tasty and fun to eat. And not as nasty as it looks. 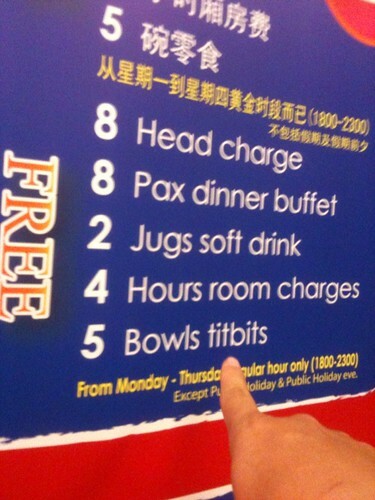 This karaoke place in Malacca offer "titbits" and has a "head charge" I am not sure if we should go there. The school holidays are upon us again. For four weeks in June, kids get to go on vacations, play with friends, and drive their parents batty. And come mid-November, they get to do it all over again for six weeks. The school holiday season stresses many Singapore parents out. Shall we take the kids to a holiday? Or is it too expensive in these economic times of cautious optimism? Perhaps we should look into school elective programs? Say, swimming, or music appreciation, or 11th century European Medieval History for Seven-Year-Olds? But will that take up time meant for our kids to find themselves? I think I lost about 2kg in sweat and burned several thousand skin cells in the sun after my day at the Navy Open House. The Singapore Navy invited a few of us to a preview of their event at Changi Naval Base. The Open House takes place on the 22nd and 23rd of May 2010, and they are expecting 100,000 visitors over that weekend. I am thankful for being allowed to perspire with relatively fewer people. A touching video done by Singapore Bulldog Cyclists, for this year's Ride of Silence, a silent slow-paced ride in honour of those who have been injured or killed while cycling on public roadways. Some of our fallen comrades we remember this year: Ben Mok and Evelyn Toh. May God be your partner on your final ride"
Update 2: New copy uploaded by someone else. I linked to this new one! Epic suay, man, the emcee. Comment of the week: "This wouldn't have happened﻿ if you appointed someone who isn't an Ah Beng to emcee for this event." Three weddings in a month was a little hectic but it was great to see my friends so happy. To the grooms and brides I have had the privilege of taking unofficial photos of, many blessings in your new journey together! And did I also mention how much I love black and white film too? It also helps to have such lovely subjects to make photos from, of course! Over the weekend, the wife dragged us to the Havaianas store at ION to pick out some flip flops for the family. It was also an excuse to take the Circle Line. So grandma, mommy, maid, me, and three kids all took the train to town. I got the glow-in-the-dark ones so that I can wear my glow-in-the-dark Threadless tees with them when I watch movies. Isaac picked out a blue robot pair, Joy wanted the yellow pair with straps (and we picked out an extra red pair with a sweet on it), and mommy got the gold pair with heels. We tried to get a pair for Faith but she toe-walks too much for flip flops to be practical. Now the next thing to teach the kids is how to walk in flip flops without the drag-drag-drag sound. Even the wife got a little scolding from me for dragging hers. I was brought up by a strict Dad and we were never allowed to walk like Ah Bengs even in slippers. Those are pretty slick moves, no? One of the interesting quirks of having a 6-year-old son with an active imagination is that our appliances become his canvases. We still own the Ikea table lamp he drew on two years ago and it still makes us smile every time we turn it on. This time, the wife found the floor-standing electric fan we use in my study, in a new state. Isaac stuck the 3D glasses he found on my desk to the lid of the fan, drew and cut out a nose and mouth, and voila! Fan transformed to a robot. I have discovered eyes, noses and even tiny paper hands, attached to other things like my iMac and the Ikea baby chair too. And these discoveries are always a delight to find. The only problem is I keep running out of scotch tape when I need it. Isaac recently apologised to me for using up the last bit of a 3M roll. I didn't have the heart to scold him and just said, "Papa will buy some more, don't sweat it, dude." Chinese very difficult to learn but we can make it easier with the right teacher! Class is on at mrbrownshow.com! My kids were spotted playing with this worn and tattered book in the living room, before we realised it was my mother's old recipe book. She quickly grabbed it back from their grubby hands and said, "How did they find my little piece of history ah?" "You probably left it lying around lor," I said, knowing my mother's somewhat bochup ways. The book was "My Favourite Recipes" by former Methodist Girls' School (MGS) principal, Ellice Handy. My mother's edition is the 1952 one (I believe it is the first edition), and it contains all kinds of yummy Asian recipes. There are notes scribbled in pencil all over, some by my mother, some by my aunt (her older sis). Mom said when the book came out, all the MGS girls were "persuaded" to buy it for the school building fund because the proceeds would go to that. My mother and her sisters were unique in those days, in that her father believed that girls should get an education too. So they all attended MGS and subsequently, higher education. I am glad for this recipe book. Many of mom's great dishes came from this book. I am hoping she sends it for rebinding. The binding of the book is kind of falling apart and it would be a shame to see the book damaged any further. I also adore the drawings on the cover. There is a modern edition of this book, I believe. But this edition is a gem. Update: This entry by Bella of Northlight School was also very touching. Read her mother's reply in the comments section too. I thought it would be nice to draw your attention to some touching entries written by kids about their fathers in the Dads for Life contest running now. The entries are dreadfully and refreshingly honest and candid. Go check out the entries and vote for your favourite entries. Dad you are my Dad for Life and i’m really happy when you joke and laugh with me. I love it when we are playing computer or cycling with the family in the park together. You help me learn a lot of information when i find a shell, plant or animal i don’t know about by telling me what it is and some information about it. You always help me with my emotional troubles. When i am feeling bad because things are not going well in school or with my friends i would tell you and you would always come up with an explanation or a solution to my problems. You’re my Dad for life and I’m happiest when you are here for me. My friend Jennie told me on Sunday night about the A Moment in Time project from NYT. You were supposed to take a photo at 1500h GMT, Sunday, 2nd May 2010 (11pm our time) and submit it to the pool to capture a moment in time. By collecting the photos, they hope to show a mosaic of the world at this moment. It was so popular a project their server crashed. So at 2250h, I grabbed my camera, jumped on my bicycle and biked as far as I could go before the 2300h timing, and snapped some shots. The one above was what I submitted in the end. You can see some of the early selections at the NYT Lens Blog. Here were some of the other shots I took.